By Rachel Kurlander for Fathom | Our server looked incredulous when I said I’d never tried grits before. I had never tried hush puppies either — or crayfish, or grouper, or pimento cheese — before a recent trip to South Walton, a coastal community in the Florida Panhandle. Despite having visited family in Florida for the last 20 years, this region felt a world apart from the Florida I thought I knew. South Walton is closer to Atlanta, New Orleans, Birmingham, Memphis, and Nashville than it is to Miami, and everything from the cuisine to the warm, overbrimming Southern hospitality served as a constant reminder that I had ventured where few northerners had been before. You’ll be dreaming of the all-white stucco homes of Alys Beach long after you leave South Walton.PHOTO COURTESY OF VISIT SOUTH WALTON. South Walton is made up of sixteen planned towns built less than 30 years ago, affording regional planners and architects an opportunity most can only dream of: to construct entire towns from the ground up. South Walton’s blessing, and what makes it worth visiting, is that these charming, idealized, perfect towns (and they really are perfect: think white picket fences, building codes that require each home to have a courtyard, and beautiful, tanned residents with impeccable Southern manners) manage to retain a genuine spirit. Located between Panama City Beach and Pensacola, in the northwest part of the state, it serves as a popular vacation destination for visitors from neighboring Texas, Louisiana, Mississippi, Alabama, Georgia, and Tennessee. The main draw is the 26-mile stretch of white-sand beach along the Emerald Coast, named for the calm, turquoise waters of the Gulf of Mexico that lap South Walton’s shores. But that’s not all the area has to offer: You’ll find exceptional design, a variety of restaurants and shops, outdoor recreation, a thriving art scene, and daily events year-round, drawing families with children of all ages, couples young and old, honeymooners, and bachelorette parties alike. 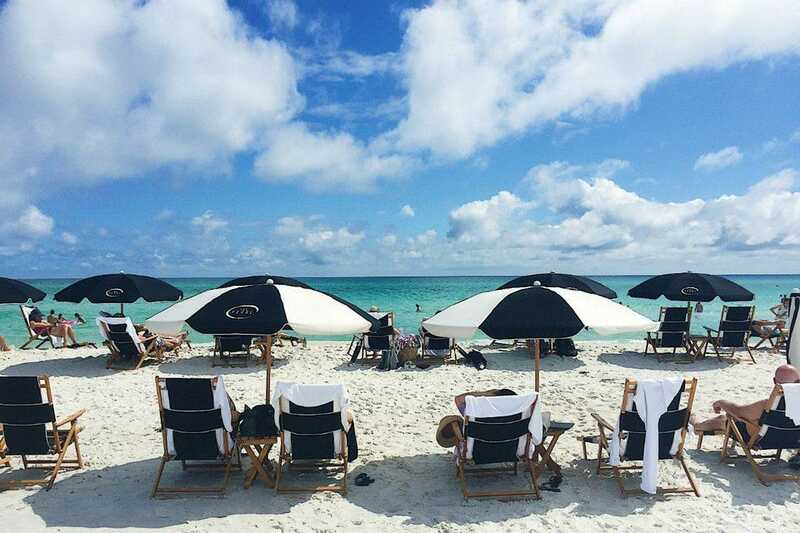 Beach chair and umbrella service, compliments of the Pearl Hotel.PHOTO BY RACHEL KURLANDER. From east to west, the sixteen coastal towns of South Walton are Inlet Beach, Rosemary Beach, Seacrest, Alys Beach, Watersound, Seagrove, Seaside, WaterColor, Grayton Beach, Blue Mountain, Santa Rosa Beach, Gulf Place, Dune Allen, Sandestin, Miramar Beach, and Seascape. The neighborhoods are connected by two highways, Country Road 30a (CR 30a), a scenic route that goes directly through several town centers (with adjacent bike and pedestrian paths), and Highway 98, the faster, more direct way to get from point A to point B. Every town has something different to offer, and I’d highly recommend learning more about each before settling on a home base. 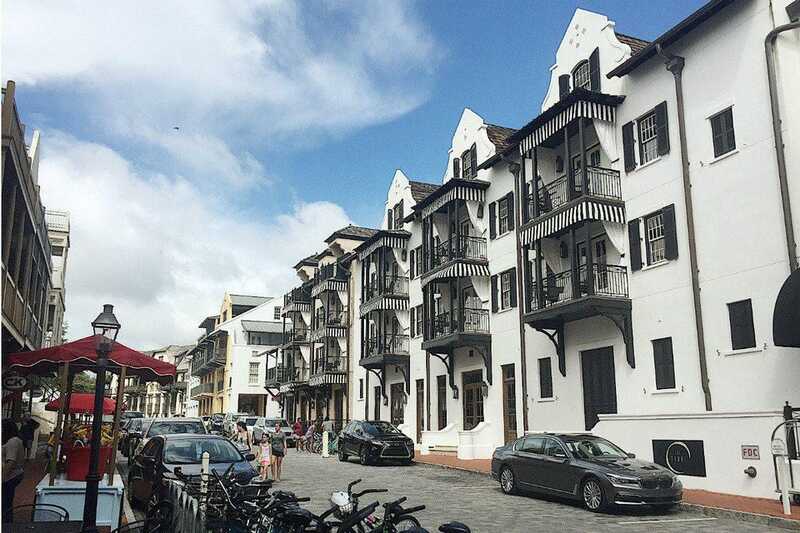 But in general, the main points of interest are Rosemary Beach, Alys Beach, Seaside, Santa Rosa Beach, WaterColor, Grayton Beach, Blue Mountain, and Gulf Place. Before the beach towns of South Walton were built, the land on which they stand today was owned by the St. Joe Company, a timber and paper operation that, at its peak, controlled over one million acres of land. It closed its mill in the late ‘90s and pivoted to land development (it’s still active in the area), just as the blueprints for the community were being drawn up. A group of University of Miami architecture students outlined an ambitious prototype for a town modeled on the New Urbanism movement, which prioritized a strong sense of community in which residents take an active role in planning and business development. This means pedestrian-friendly design means a central commercial hub easily reached on foot from any point in town. Seaside, with its quaint, pastel-colored beach cottages, was born, and fifteen other communities soon followed. 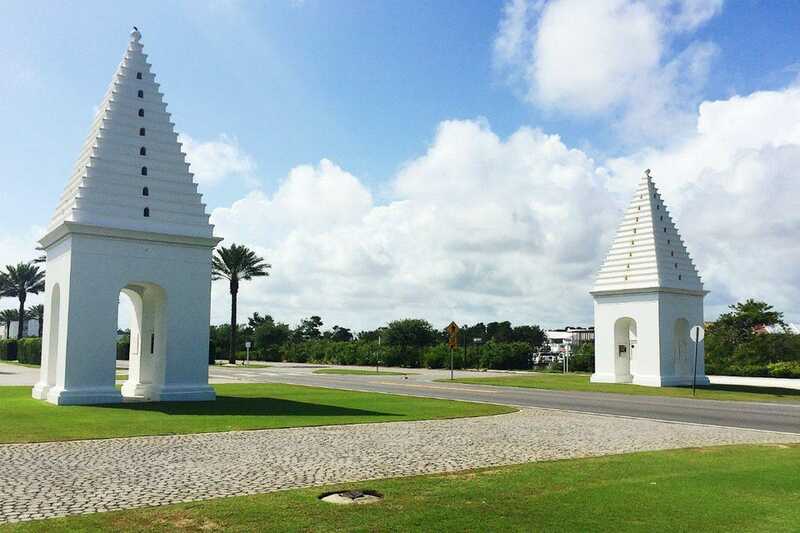 Modeled after traditional Bermudian “butteries” used to store perishable dairy products, these structures mark the entrance to Alys Beach.PHOTO BY RACHEL KURLANDER. On the whole, South Walton trends towards upscale, which sets it apart from nearby Panama City Beach, another popular vacation spot. Some South Walton towns are more budget-friendly than others. 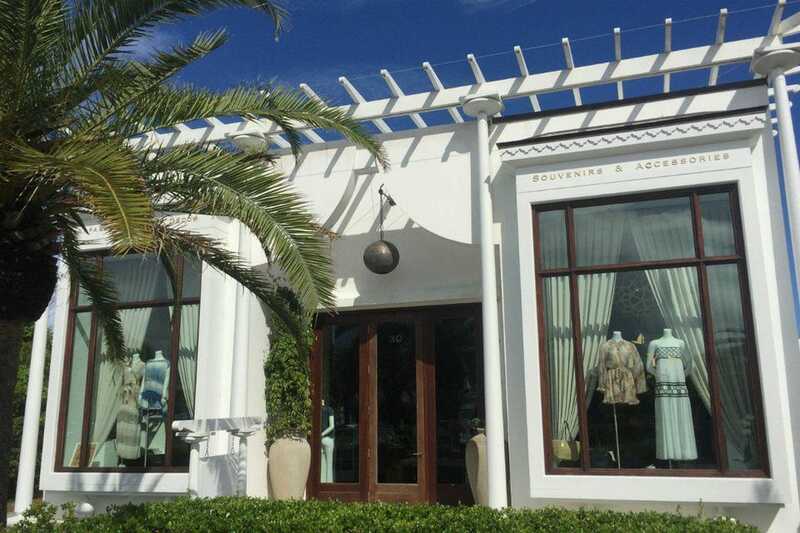 Clothing boutiques and home furnishing stores in Rosemary Beach, Alys Beach, and Seaside, for example, are high-end, with nary a strip mall in sight. Country music stars like Sheryl Crow and Luke Bryan vacation here (and sometimes play free concerts, if you’re lucky enough to catch one), as do well-heeled Southerners, which explains the perhaps inevitable “Hamptons of the South” comparisons. Nine distinct pavilions, each designed by a different architect, stand at the beach access points in Seaside.PHOTO BY RACHEL KURLANDER. Go to the beach. They don’t call this the Emerald Coast for nothing! 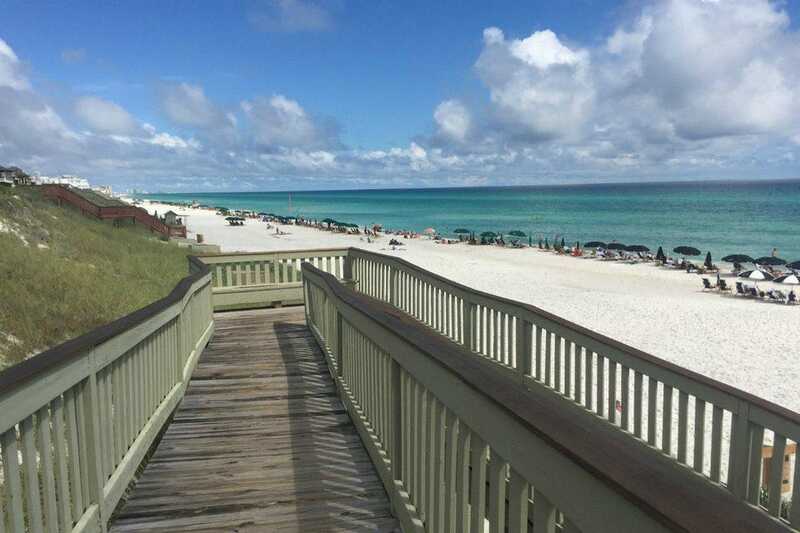 There are eight public beach entry points in South Walton, but a stay at a hotel or in a rental property will usually include access to that neighborhood’s own private beach. Public beaches are surveilled by lifeguards from mid-March through September, and a colored flag system at every beach monitors surf conditions. Gulf waters tend to be calmer than the ocean, but swimmers should always exercise caution. 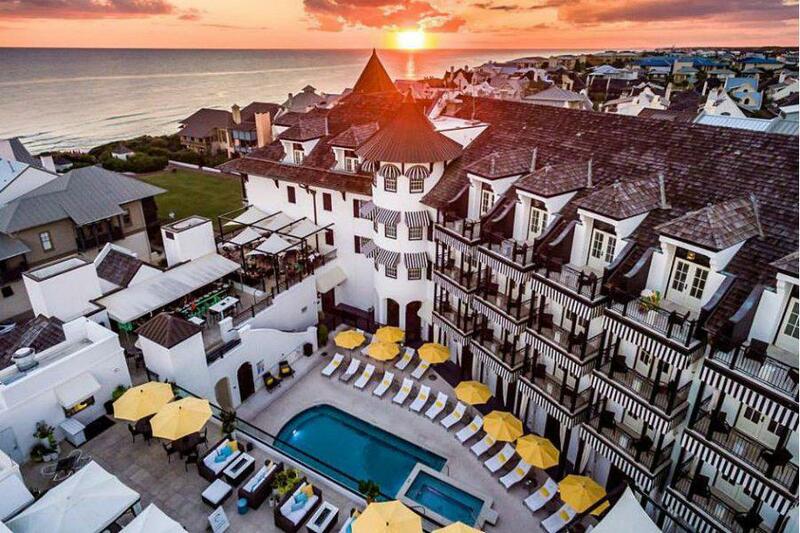 For high-end boutique shopping, head to Rosemary Beach or Alys Beach.PHOTO BY RACHEL KURLANDER. 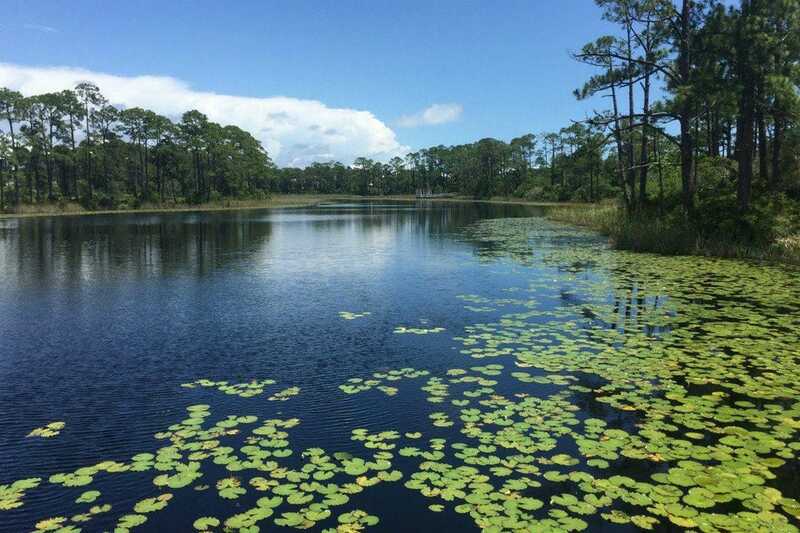 Forty percent of the land in South Walton is protected by the state of Florida, shielding the area’s natural beauty from developers, even as visitors flock here in record numbers and the tourism industry continues to boom. There are four state parks and one 15,000-acre state forest, home to campgrounds, diverse wildlife, and hundreds of miles of hiking and biking trails you may not even think to look for in a beach town. 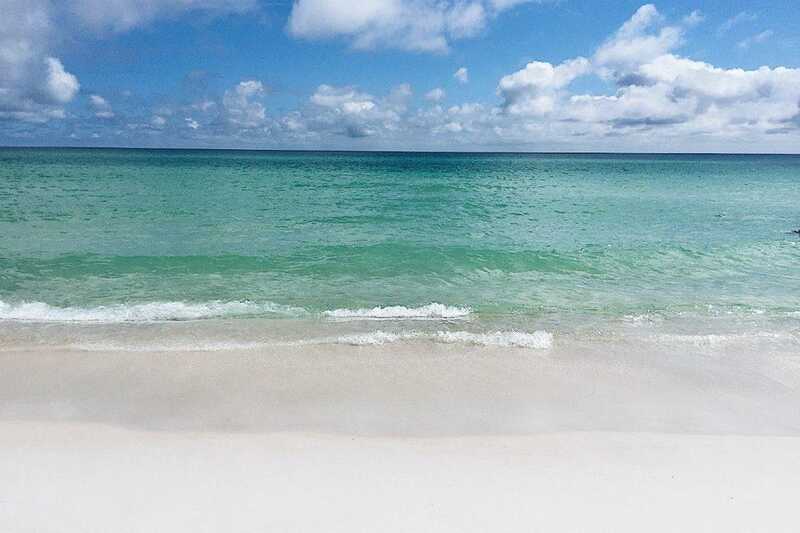 Whoever named this “the Emerald Coast” was on to something.PHOTO BY RACHEL KURLANDER. You’ll also see incredibly rare bodies of water — likely without realizing it. Coastal dune lakes are shallow lakes located less than two miles from a shoreline, and they’re only found in Madagascar, Australia, New Zealand, the Pacific Northwest, and here. In fact, South Walton is home to fifteen of them, making it the area with the largest concentration of coastal dune lakes in the world. During periods of heavy rainfall, freshwater outfalls, or currents of lake water, breach sand barriers and flow out into the gulf, while salt water flows in until salinity levels stabilize. The lakes, therefore, are unique ecosystems that support both freshwater and saltwater marine life. Western Lake, one of South Walton’s largest dune lakes.PHOTO BY RACHEL KURLANDER. 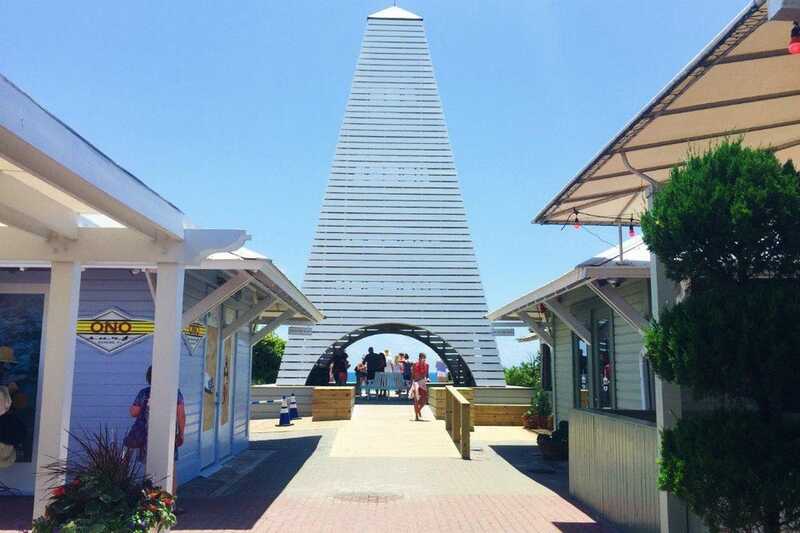 All of South Walton’s planned towns are unique in their design and overall feel, and there are a few in particular that are worth spending a day touring on bike or on foot. Rosemary Beach and Seaside are the easiest to explore, since both have pedestrian-friendly, lively downtown areas filled with shops and restaurants, as well as nearby residential streets that you could easily spend an afternoon wandering. In Rosemary Beach, pan-Caribbean-style homes line shaded streets connected by hidden pocket parks and wooden boardwalks that lead to the beach, while Seaside is a breezy, pastel-colored dreamscape home to little beach cottages with white picket fences. 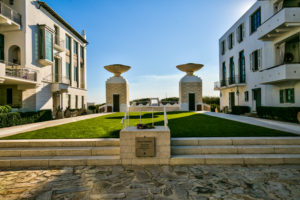 Alys Beach, South Walton’s newest community, is known for its glittering white stucco architecture that lends the town a polished, Mediterranean vibe. 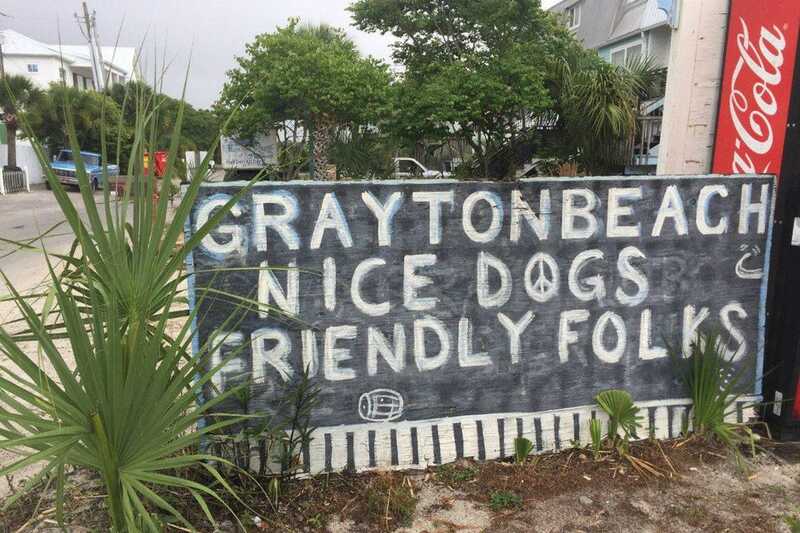 Grayton Beach, home to Grayton Beach State Park, the Shops of Grayton, and funky dives like The Red Bar and Hurricane Oyster Bar, is one of the more alternative towns in South Walton, with the (unofficial) motto, Nice dogs, weird people. This may as well be the official sport in these parts. A favorite activity among locals and visitors alike, it’s hands-down the best way to discover South Walton’s dune lakes. Drift past sawgrass marshes and rolling, white sand dunes, or, if you’re lucky (and brave), paddle down an outfall, the narrow channels that spill out from the dune lakes into the Gulf. Don’t be alarmed by the odd coloring of the lakes: Tannins from vegetation give them their tea-like hue. 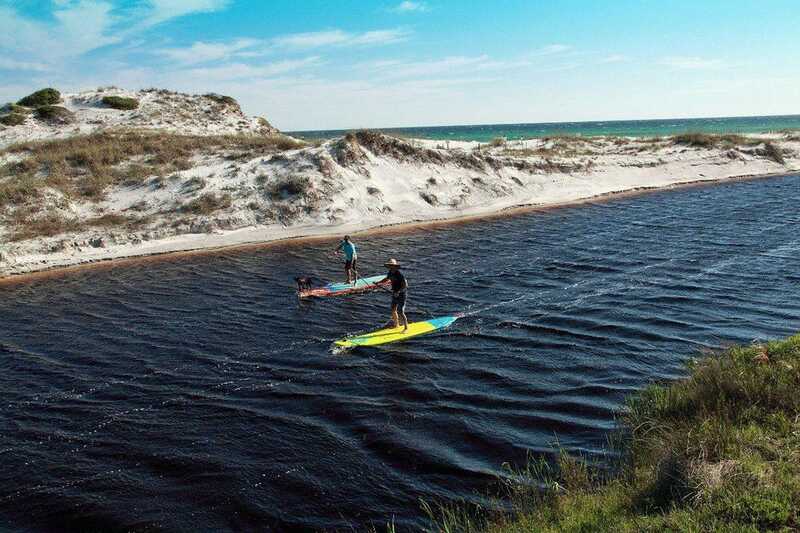 YOLO Board, founded in South Walton by SUP-aficionado Jeff Archer, is one of the most trusted brands for gear rentals in the area, offering group paddle activities and beginner lessons. Paddle (or drift, we won’t judge) past windswept, white sand dunes. Photo courtesy of Visit South Walton.PHOTO BY RACHEL KURLANDER. Who wouldn’t mind an extra oomph of power spurring their bicycle along every now and again? E-bikes are built just like regular bicycles, except with a motor and battery that can be activated using a handlebar throttle. Riders pedal just like they would on a regular bike, and that motion activates a motor that augments human power for a smoother, less strenuous ride that won’t leave you exhausted for the rest of the day (unless you get throttle-happy like me, in which case, pedals be damned!). The bikes are designed for all skill levels — if you can ride a bike, you can e-bike — but first timers may want to start with a guided tour led by Eventure Tour Company, which offers a wide range of group and private themed tours around South Walton. It was pouring rain on our tour, and we still had a blast. Inside Mary Hong’s Grayton Beach studio at the Shops at Grayton.PHOTO BY RACHEL KURLANDER. With preserved lands and 26 miles of sparkling coastline, it’s no surprise that there’s an artistic community seeking to capture the area’s natural beauty. 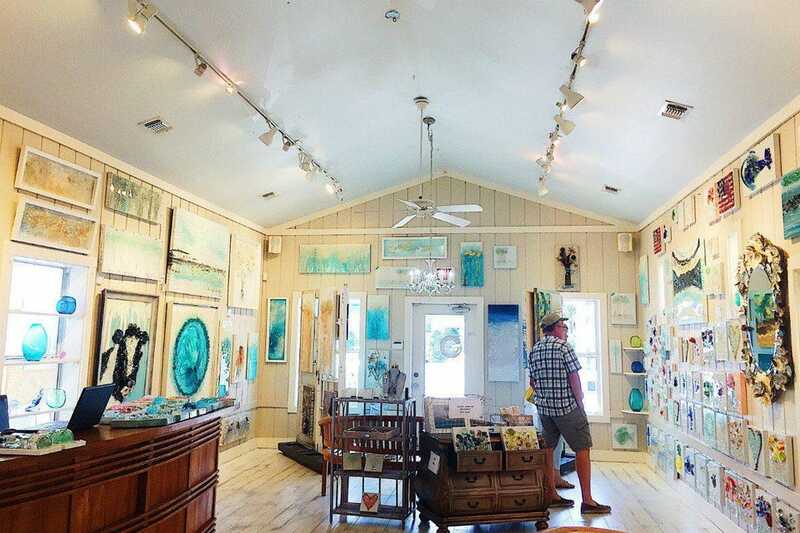 At the Shops of Grayton in Grayton Beach, you’ll find the galleries of Mary Hongand Andy Saczynski. Hong uses found glass on canvas to compose seascapes, marine life, and other nature motifs, and visitors to her studio can even take classes to learn more about her technique and create their own glass works (a perfect way to spend a rainy day). Saczynski transforms recycled materials into funky, bold, 3D wall art. Justin Gaffrey, whose studio is located just off 30a in Santa Rosa Beach, layers heavy acrylic paint for a thick, textured style to depict local wildlife and gulf coast landscapes. Keep an eye out for their work around South Walton and impress your travel companions with your local art acumen. You’ll be “hoppy” you stopped at Grayton Beer Company.PHOTO BY RACHEL KURLANDER. 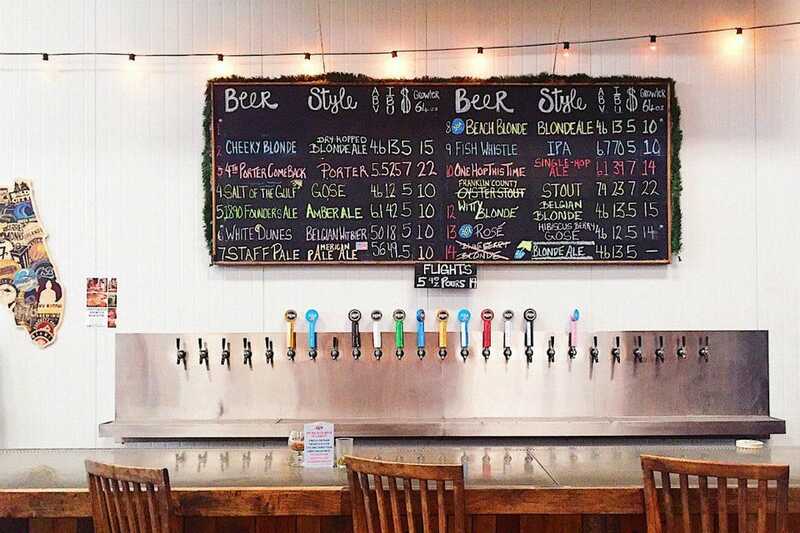 You don’t have to be a beer enthusiast to stop by the taproom of South Walton’s only brewery in Grayton Beach, known around town for its 30A Beach Blonde Ale. Sample craft beers — from crisp, light-bodied brews to hoppier ales, IPAs, and a new seasonal Rose Gose, a summery draft. If it’s on tap, don’t leave without trying the Dubbel Barrel, a Belgian-style Dubbel aged in bourbon casks at Nelson’s Green Brier Distillery in Nashville (this one made the trip back to New York with me). If you’re someone interested in what you’re drinking, call ahead and schedule a tour of the facility led by one of the brewers. This spot is also a popular venue for concerts; check the events calendar for upcoming shows (children and pets are welcome!). Rental properties are by far the most popular accomodation option, best suited for those traveling with children. While homes range in size and price, many tend to be quite spacious (sleeping 10+) and are often rented out by large families (or several families) traveling together. The vast majority come with full kitchens, washer and dryer, A/C, and private beach access, and many have pools. Keep in mind that during the high season, some companies only rent properties on a weekly basis (Saturday – Saturday). 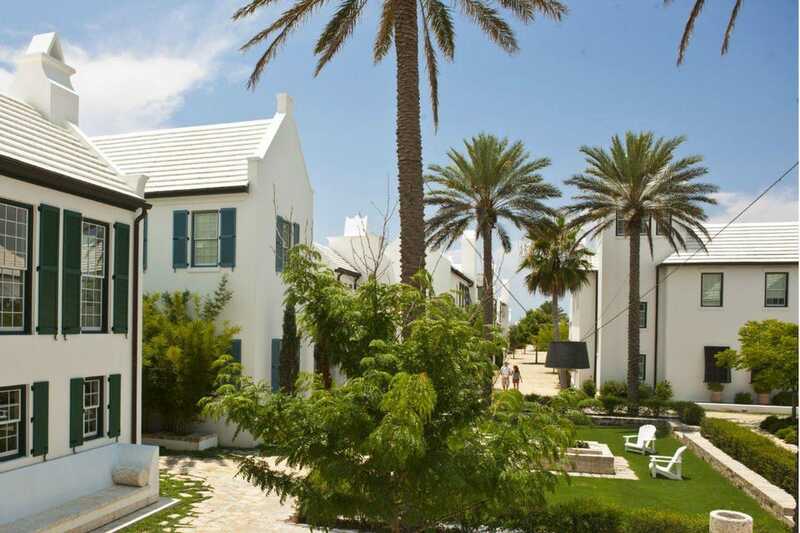 360 Blue, Alys Beach(for rentals in Alys Beach), and Wyndham Vacation Rentals are three dependable agencies. 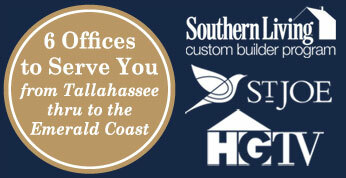 Refer to the accomodation section of the Visit South Walton website for more information. Don’t leave Rosemary Beach without making your way up to The Pearl Hotel’s rooftop lounge: You won’t regret it.PHOTO COURTESY OF ST. JOE CLUB & RESORTS. Located along the avenue that runs the length of Rosemary Beach’s town center, just steps away from a private beach, is one of South Walton’s only high-end boutique hotels. The tropical, pan-Caribbean design — from the striped awnings, billowing drapes, and sun-drenched balconies down to the complimentary cigar boxes with jars of pimento cheese in each room — is basically an invitation to take it slow. So unwind at the adult-only swimming pool and poolside spa or head down to the beach, where beach chair and umbrella service is included in your stay. The rooftop, complete with a full bar, fire pits, and alfresco lounge seating, is the spot in Rosemary Beach for pristine Gulf views. As a member of the St. Joe Club & Resorts group, guests of The Pearl also have access to all St. Joe amenities, including private golf courses, fitness centers, tennis facilities, and the WaterSound Beach Club. Another St. Joe member property, guests benefit from exclusive access to a wide array of resort-style amenities without having to sacrifice the comforts of a cozy, charming inn. In the lobby, beach-inspired works by prominent local artists mingle with coastal cottage decor: seashells, nautical stripes, and a seafoam palette. The view is fitting: Outside, a boardwalk leads straight from the pool down to a private beach. At this hotel-style resort located a short walk from Rosemary Beach, one, two, or three-bedroom units are available either for rent or on a nightly basis. The vibe is modern and beachy, and, since the property was built in 2017, every unit is furnished with new appliances, like stainless steel kitchens and a washer and dryer. On-site amenities include a pool, covered poolside lounge, a rooftop bar, fitness center, and a restaurant, Big Bad Breakfast, serving traditional Gulf Coast fare under the direction of a James Beard award-winning chef. In addition to these smaller properties, there are also four large resorts in the towns of Seascape and Sandestin for those seeking the full-service getaway treatment. 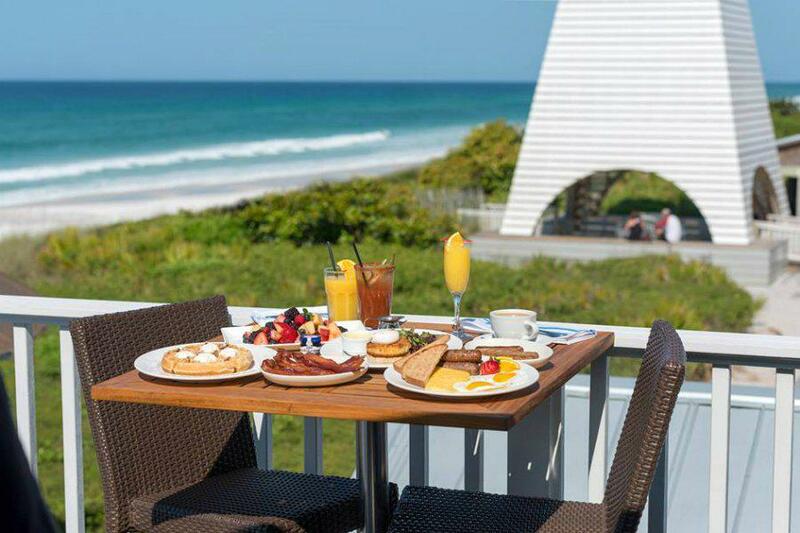 “Misbehaving” at George’s.PHOTO COURTESY OF GEORGE’S AT ALYS BEACH. At this upscale seafood restaurant, the menu is divided into two categories: Behave and Misbehave. Diners can choose from lighter, healthier seafood options, like spiced grilled salmon or seared sea scallops, or indulge in a hedonistic helping of meat with accompanying sides like pudding, gravy, Southern-style slaw, and grits. If you can, sit outside on the wraparound porch and take in the mesmerising all-white architecture of Alys Beach. Note that George’s doesn’t accept reservations, so be prepared to wait on weekend nights. 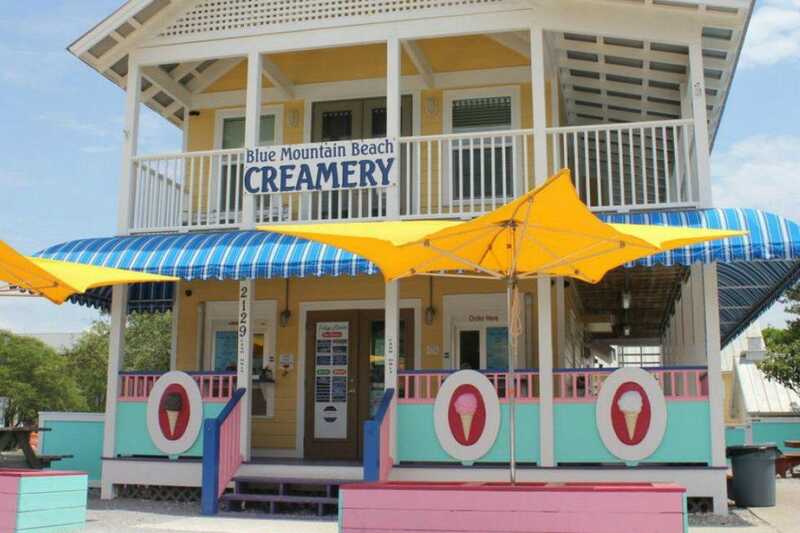 It’s hard to miss the Blue Mountain Beach Creamery.PHOTO COURTESY OF BLUE MOUNTAIN BEACH CREAMERY. 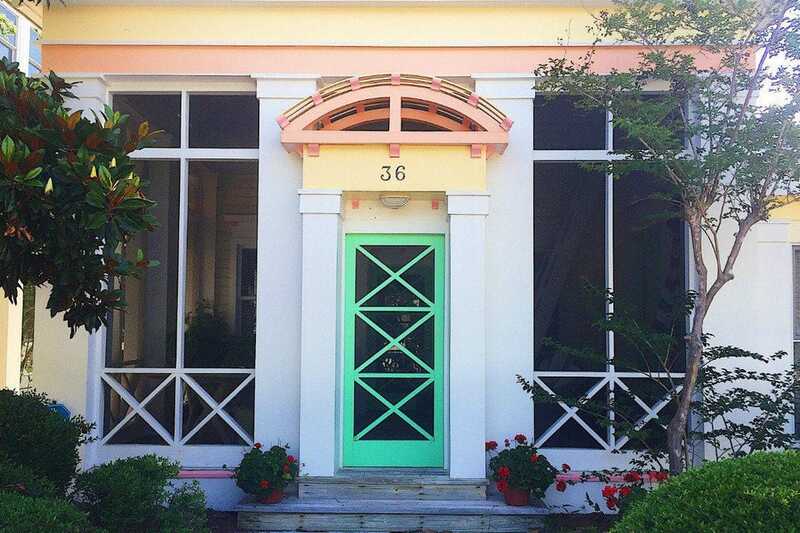 You can’t miss this pastel-colored cottage just off 30a, and the swaths of cars and people outside will tip you off to just how sought after their frozen treats are (note: it’s cash only). All ice cream, frozen yogurt, and sorbet is homemade, the scoops are (very) generous, and there’s plenty of outdoor seating, making it the perfect spot for cooling off after a day on Blue Mountain Beach, one of the few public beach access points in South Walton, just a short walk down the road. Located in one of the adorable, bright beach shacks at the Shops of Grayton, this cafe, coffee shop, and bakery is where you go for a fresh, light meal in between daily serving of grits and hush puppies. Whether you order a sandwich or tartine, don’t leave without trying the house-baked breads. If you can’t make it, just look for Blackbear Bread on the menu at any South Walton restaurant, since so many source it directly from the bakery. 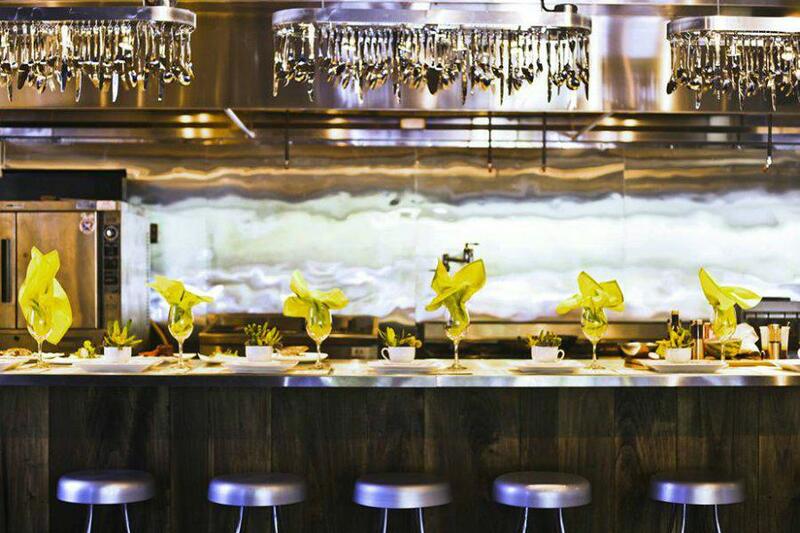 Make a reservation far in advance for the bi-weekly (Tuesday dinner and Sunday brunch), 34-person seating at this chef’s table restaurant. The open concept kitchen, candlelit interior, and communal farm tables make for an intimate setting — so intimate in fact that Nikhil, the head chef, will greet you personally and check in throughout the course of your meal. The menu is an offering of sharing plates like roasted cauliflower, razor clams, and matcha panna cotta, so good you may not want to share them, and that’s okay, too. 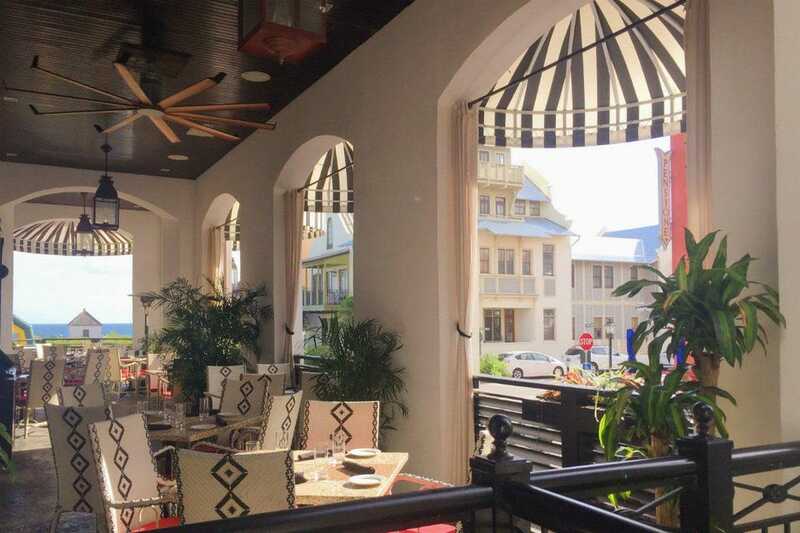 Cuba meets Charleston on the wraparound veranda at Havana Beach Bar & Grill.PHOTO BY RACHEL KURLANDER. Situated on the ground floor of The Pearl Hotel, this restaurant takes its aesthetic cues from El Floridita, Hemingway’s favorite old-town Havana hangout. 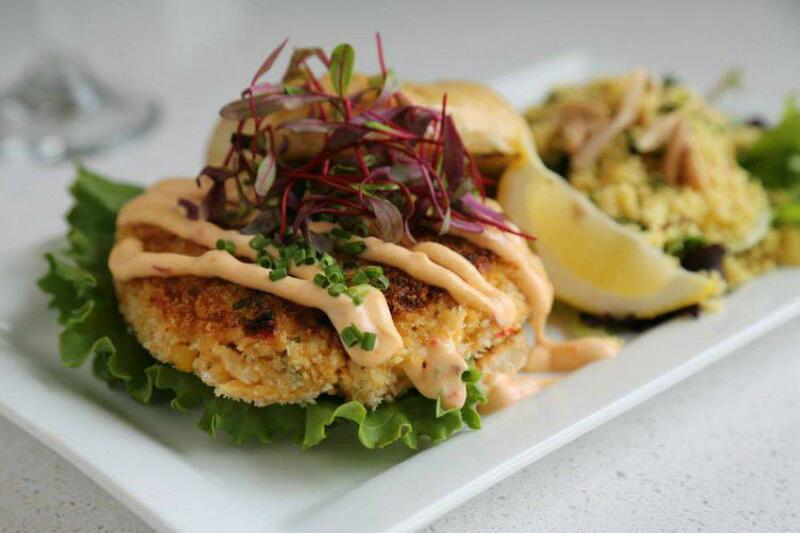 The menu is a blend of traditional Gulf Coast cuisine and Caribbean flavors that highlights locally-sourced and harvested ingredients, like blue corn and soft shell crab. Enjoy breakfast, lunch, or dinner in the main dining room or on the airy outdoor veranda with views of the Gulf, then move upstairs to the rooftop lounge for a refreshing cocktail. The rooftop at Bud and Alley’s, looking out over the Gulf.PHOTO COURTESY OF BUD AND ALLEYS. You won’t get very far in Seaside without encountering Bud, the town’s official mascot. He was the beloved dachshund of Robert Davis, Seaside’s founder, and his image emblazons all things Seaside, from merchandise to restaurants. Bud and Alley’s is 25 years old, an ancient relic in South Walton years and its oldest restaurant. It’s discussed among residents and visitors alike in terms more akin to a hallowed institution than a seafood restaurant. Eating here, or at the adjoining pizza joint or taco stand, is a must. 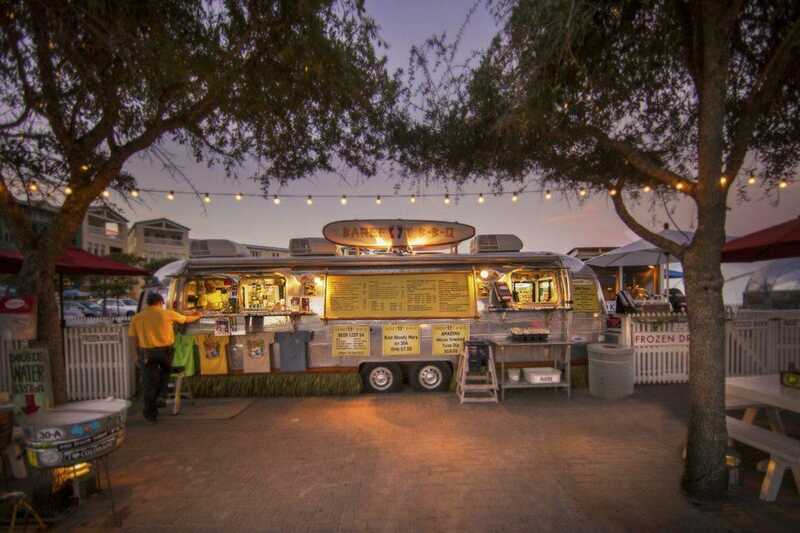 Not your average food truck.PHOTO COURTESY OF VISIT SOUTH WALTON. What do you get when you combine a food truck and an Airstream? See for yourself along the stretch of 30a that runs through the Seaside town center, where a half dozen vintage Airstreams sell everything from organic juices to gourmet doughnuts and grilled cheese melts. All trailers are parked next to one another, making it easy to hit each in one fell swoop — and don’t even try to resist the temptation to do so. The famous Grits a Ya Ya.PHOTO COURTESY OF GREAT SOUTHERN CAFE. Executive Chef Jim Shirely knows good grits (just consult the Pensacola News Journal archives for his weekly “Good grits!” columns or his Good Gritscookbook). 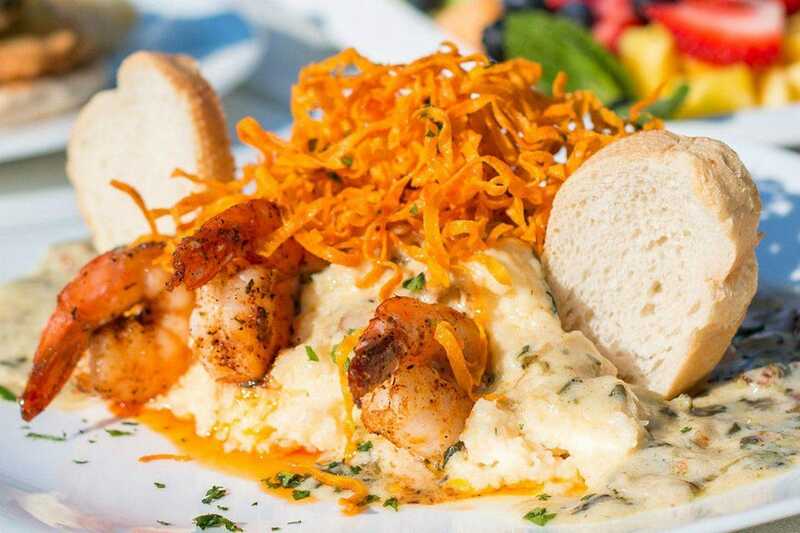 If you’re new to the Southern staple, consider this cafe your initiation, with one caveat: Grits a Ya Ya, the restaurant’s signature dish of Gulf shrimp on a bed of creamy, gouda grits, are so out-of-this-world tasty that they may set the bar too high. There are three airports in the area: Northwest Florida Beaches International Airport (ECP) in Panama City, Destin-Fort Walton Beach Airport (VPS), and Pensacola International Airport (PNS). There are direct flights from most southern and midwestern cities, and more are being added over the upcoming months. If you’re not yet able to fly direct, multiple daily flights leave from Hartsfield-Jackson Atlanta International to the three airports (flight time is under an hour), making for easy connections. Driving time from New Orleans and Atlanta, the two closest major cities, is five and six hours, respectively. The easiest way to get around is by car, and most visitors drive to South Walton. Parking spots are usually easy to come by (and many towns are in the process of adding more), and traffic is only a real problem on Saturdays, the move-in and move-out day for most rental properties. Avoid 30a and stick to Hwy 98, which also runs the length of South Walton, if you’re trying to get somewhere in a hurry. There are rental car agencies in Destin, Panama City Beach, and at the airports, but if you don’t have a car and want to avoid renting one, Uber and Lyft are already well established. If you’re only based in one or a few towns, South Walton can be easily explored by bike or on foot. Every neighborhood is extremely safe, so while one should always exercise caution when walking around at night, there is no need to avoid staying out past dark. In Rosemary Beach, every wooden walkway leads to the beach (including this one! ).PHOTO BY RACHEL KURLANDER. Summer is the high season, when rental properties tend to be more expensive and more families visit. Locals will tell you that fall is the best time to go, since it’s not as hot and there are fewer crowds. But this comes with a big caveat, as June through November is hurricane season. Winter and spring are (relatively) cooler and tend to see more rainfall, but the reality is that the Florida Panhandle is blessed with mild-to-hot temperatures and plenty of sunshine year-round. When it does rain (and it rains, hard), the storms tends to pass quickly, so don’t let an ominous-looking sky stand in the way of your outdoor plans. Two words: Southern hospitality. If you’re not from the South, exchanging pleasantries with strangers may strike you as impertinent or downright creepy, but around here everyone greets each other politely, even if it’s just in passing. So be friendly, flash a smile, and return the courtesy. The communities of South Walton are beach towns, which means the dress code is scanty swim attire — bathing suits, flip flops — on and off the sand. An umbrella: Weather in Florida is notoriously unpredictable, so always be prepared to get caught in a rainstorm. (Don’t worry, it’ll pass.) Many hotels and rental properties provide guests with complimentary bicycles, albeit rudimentary ones. They’ll get you from A to B, but if you’re particular about your ride or looking to cover long distances, you should bring your own. If you’re reluctant to leave your four-legged friend at home, don’t, as South Walton is extremely dog-friendly.